Jenna Springer is all too familiar with the profession of physical therapy. She had to undergo several months of rehabilitation for her foot while in college. In fact, she will tell you that her injury and exposure to physical therapy is what inspired her to pursue a career in healthcare. She recently graduated from the University of Nebraska at Omaha with a degree in Exercise Science. She plans on attending occupational therapy school in the future. 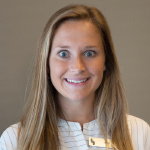 Jenna is a bubbly, happy, and physical therapy aide at Omaha Physical Therapy Institute. You will often see her bouncing around the clinic, cleaning and organizing, and making sure everyone is having a great day! If you ever need a hug, she offers them for free!